I moved to Brixton in early 1987, and started working for Lambeth Council in the libraries. The pay wasn’t great but as I was squatting on Tulse Hill Estate (Greenleaf Close) I wasn’t paying any rent so money wasn’t a problem. The Council itself admitted that there were at least 1200 squatters in Council properties in this period (South London Press,15/2/88 – henceforth referred to as the SLP), so I certainly wasn’t alone. It was a time of crisis in the local state, with the Conservative central government setting strict limits of what Councils could spend. One group of Lambeth Labour Councillors (led by Ted Knight) had already been disqualified from office for attempting to defy this. Their successors, led by Linda Bellos, were in the contradictory position of publicly decrying the cuts while implementing them. The atmosphere at work was marked by almost total disengagement from the employers, something I was made aware of in my first week. Like most library workers I joined NALGO, the main union for ‘white collar workers’, who were then enforcing a ‘work to rule’. This involved people refusing to cover for vacant posts by working for more than two hours on a service point. So if a library assistant was asked to work a shift on the front desk for longer or without the usual number of colleagues on duty, they would refuse to work it and the library would have to close. ‘Absenteeism’ was rife, so it was common for the usual number of staff not to be on duty – as a result, closures were quite frequent. There was also some solidarity action going on in support of the historic strike at Rupert Murdoch’s News International (publishers of the Sun and the Times). This was then in full swing following the management relocating production from Fleet Street to Wapping in order to break the power of printworkers. I had been down to some of the regular mass pickets of the Wapping plant, sometimes featuring violent clashes and police charges. In the library, workers refused to handle News International papers – normally all the papers would be put out for people to read. I went to my first union branch meeting at Brixton Town Hall in February where there was a speaker from Wapping. It was informally agreed that the boycott would continue though no vote was taken in an attempt to avoid legal action by Murdoch’s lawyers. In terms of the Council, matters reached a head late in 1987 when the national Government announced the following year’s funding for local authorities. For Lambeth, a spending limit of £152m was set for 1988/89, compared with £210m in the previous year. The Council responded by planning cuts and putting forward controversial plans for a compulsory redeployment scheme. This was to involve cutting jobs by freezing recruitment when posts became vacant and then moving people from other jobs to cover them. Basically people would have been forced to change jobs within the Council and made redundant if they refused. At a NALGO mass meeting just before Christmas (17/12/87) around 400 people agreed to stage a one day strike to coincide with the Council’s budget setting in the New Year. The union meeting was held at the Brixton Academy, the first time I had been in the place where over the next few years I was to see Public Enemy, Sonic Youth and Fatboy Slim, to name but a few. On January 18th 1988 the Council’s Policy and Resources Committee met to vote through a package of cuts. The NALGO strike went ahead despite Council Leader Linda Bellos writing to workers telling us the strike was a waste of time since the Council had no choice but to make cuts; the deputy Tory group leader (Cllr. John Bercow) called for us to be sacked: ‘In the current financial crisis these people should be deemed to have dismissed themselves if they strike’ (‘Sack the strikers’, South London Press 15.1.88). Yes – that John Bercow, later MP and at the time of writing the Speaker of the House of Commons. In the evening there was a picket of the Council meeting in the Town Hall. We blocked the entrance and delayed some of the Councillors getting into the meeting (despite being ordered not to by union officers), then we moved into the public gallery where we did our best to disrupt the meeting. 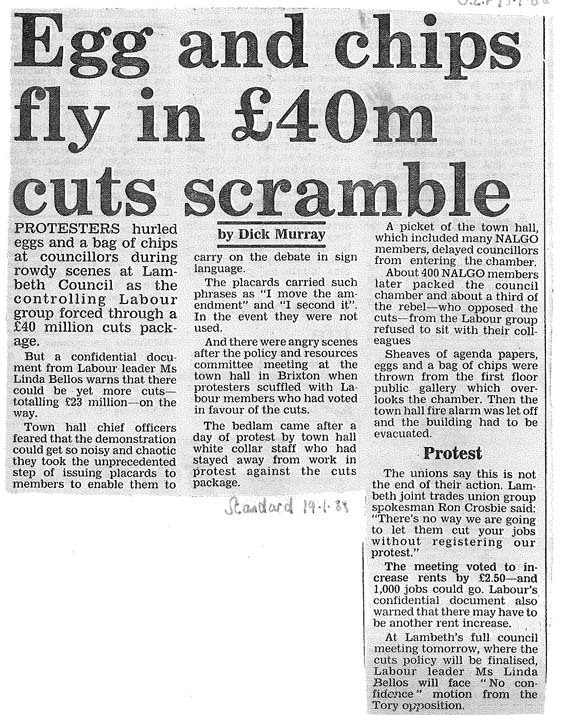 The Evening Standard reported our efforts with the memorable headline “Egg and Chips fly in £40m cuts Scramble” (19.1.1988): ‘Town hall chief officers feared that the demonstration could get so noisy and chaotic that they took the unprecedented step of issuing placards to members to enable them to carry on the debate in sign language. The placards carried such phrases as ‘I move the amendment’ and ‘I second it’… there were angry scenes after the policy and resources committee meeting at the town hall in Brixton when protestors scuffled with Labour members who had voted in favour of the cuts… Sheaves of agenda papers, eggs and a bag of chips were thrown from the first floor public gallery which overlooks the chamber. Then the town hall fire alarm was let off an the building had to be abandoned’. By the end of the week, one group of workers – the 70 Lambeth motor mechanics – were on all out strike in a cuts related dispute. Mechanics at the Shakespeare Road depot refused to cover for a vacant cleaner post and were sent home without pay. An indefinite strike was called there and at the Kennington Lane depot. The strikers, who were members of the Amalgamated Engineering Union picketed the Town Hall and Housing Office on the 21st January 1988, and many NALGO members refused to cross the picket lines. Union officers persuaded the strikers to call off these pickets in return for a promise of support which never really came to much. Pickets of the depots continued though, and when I went down I saw them successfully turn away Post Office vans, BP tankers and other vehicles. There was a still a widespread sense amongst workers that you didn’t cross a picket line. Lambeth Labour bosses responded by using private garages to repair dustcarts and other vehicles during the strike – a move denounced by strikers as amounting to ‘Rupert Murdoch’ tactics (SLP 16/2/1988). The strike continued for several weeks until most of its demands had been at least partially met – including filling the cleaners post and paying the mechanics extra ‘flexibility payments’ for doing any work outside of their job descriptions. Pressure on the Council had been increased when 30 people with disabilities staged an occupation of the social services HQ. Their transport had been affected by the strike but rather than attack the strikers they demanded that the Council should settle with the dispute. Short term occupations of Council buildings were a feature of this period. On January 29th, Brixton squatters occupied the office of the Council leader, Linda Bellos. The police arrived to chuck people out, though unfortunately for Bellos she was standing behind the door and took the full force when police pushed it open. A couple of weeks later, it was the turn of Council gardeners to occupy her office following the announcement of 80 planned redundancies. There were further disputes through 1988 involving different groups of Lambeth Council workers. 100 housing workers had their pay stopped when they refused to operate the new Housing Computer System because of concerns about its implications for staffing and pay. Then in the summer, Environmental Health workers went on strike for several weeks after they had turned up at work to find that management had reorganised their office without talking to them first. In August 1988 a NALGO branch meeting narrowly agreed (by about 140 to 120 votes) to an all out indefinite strike to demand a guarantee from the Council that there would be no compulsory redundancies or redeployment. By this time I was a shop steward and was part of the strike committee set up to build support for the strike. In the event when it went ahead from 5th September it only lasted for a few days and only a minority of workers took part. Another one day strike by 2,000 NALGO members in October 1988 was in opposition to the government’s plans to transfer the management of Council estates to Housing Action Trusts. Two Brixton housing estates, Loughborough and Angell Town, were scheduled to be in the first wave of this initiative and there was anger and opposition from tenants who saw only higher rents behind the government’s rhetoric of freedom from local authority control. When civil servants turned up to promote the plans on the Loughborough Estate they were heckled and booed by 200 tenants (SLP 30.9.88). There were also big meetings on other estates, including on Tulse Hill Estate. While all this was going on, there were other significant strikes in South London and across the country – making a mockery of Prime Minister Margaret Thatcher’s triumphalist claim in January that the nation was cured of ‘the British Disease’ of striking. In the health service the concern was low pay and the threat of cuts. 1988 started with people occupying a disused ward at St James Hospital in Wandsworth, protesting against cuts and threats to close London’s largest general hospital (SLP 3.1.88). On February 3rd there was a national day of action by health workers. A march called by London hospital strike committees was blocked by police in Whitehall with four arrests. Later we blocked the traffic on Westminster Bridge. Two weeks later there was a further day of action in London in which 12,000 hospital workers took part. The day ended up with several hundred marching to the town hall in Brixton for a rally. Another day of action on 14th March saw London bus crews, dockers, miners and others taking unofficial action in support of NHS workers. Some of us from Lambeth marched to join the pickets outside the Maudsley Hospital and Kings. Nurses at the Maudsley went on indefinite strike in September – a very rare move for nurses. Brixton DHSS staff were also among the most militant in London. There had been a long all out strike there in 1980 after two workers were sacked for union activities. Some of the Brixton militants were involved later in the 1980s with Workhouse, a national rank and file group for civil servants in the Civil and Public Servants Association union (I went to a benefit disco for them at the Asian Community Action Group on Brixton Road). [They’d also supported/taken part in the 1987-88 civil servants strike]. In August 1988 Brixton dole workers walked out on strike with other London offices against a threat to move jobs out of London. Ultimately the Brixton office was to close, making way for the famous Cool Tan squat on Coldharbour Lane in the 1990s. South London postal workers were also active in the national post strike in September 1988, with workers at the Streatham sorting office staging their own strike later in the month after two workers were suspended (SLP 30.9.88). Further afield there was a major national ferry strike at the end of January 1988, as seafarers walked out in support of colleagues sacked for striking at the Isle of Man Steam Packet Company. The National Union of Seamen called off the strike in February when the courts ruled it illegal, but workers for P&O Ferries remained on strike in their own dispute over jobs and pay cuts for over a year. A P&O striker came to a NALGO meeting in August 1988 and that summer there were collections for them outside Brixton tube station. Another front was a kind of culture war around sexual politics, with conservative forces pushing anti-gay and abortion politics. The movement against the anti-gay ‘Clause 27’ (later known as ‘Section 28’) was in full swing -.a clause of the Local Government Bill that banned Councils from ‘promoting’ homosexuality. On 9th January 1988 there was arrests on a big demonstration which saw people blockading the entrance to Downing Street and sitting down in Whitehall (I recall somebody trying to set alight to a union jack on the cenotaph – it was made of some kind of flameproof plastic!) and clashing with mounted police in the park next to the Imperial War Museum. In the same period there were also demonstrations against the Alton Bill, which sought to reduce the time limit for abortions. 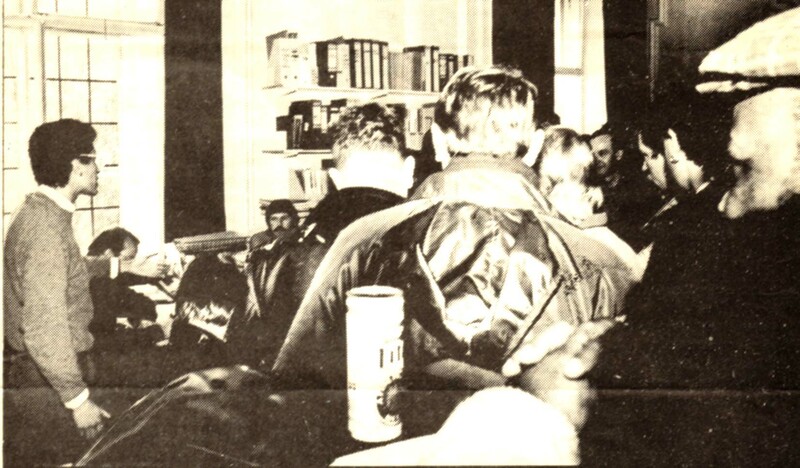 A Lambeth Against Alton group met regularly at the Town Hall from October 1987. The movement against the poll tax was also in its early days. While not due to be introduced in England until 1990, planning had started to implement it – and to resist it. At the 1988 Lambeth Country Show in Brockwell Park people queued up to have their photos taken with their head in the ‘poll tax refuser’ stocks. A few of us put out several editions of a bulletin ‘Lambeth Worker’ , with news about what was going on across the Council, as well as stickers. Publication of the bulletin was eased by the fact that one of us worked in Union Place Community Resource Centre, a Council-funded design and print shop run by a workers co-operative. All kinds of radical literature came out of there, some of it printed semi-commercially, some of it on the side by the staff. Union Place was on Vassall Road next to the Union Tavern at the junction with Camberwell New Road. It had survived an attempted fascist arson attack for which a local National Front activist (and Southwark Council dust cart driver) was jailed in 1980, but ultimately succumbed to cuts – the building has been replaced by housing. The reality within Lambeth was that groups of workers tended to be picked off one by one. The unions divided the workforce, with office workers mainly in NALGO, and manual workers split between NUPE, AEU, GMB and UCATT. But even within NALGO workers in different sections found themselves isolated. Many Union officers were embroiled in the internecine warfare within the Labour Party, making deals with the various factions cooked up in The Social Club, a cheap bar in the Town Hall, and other smoky rooms. The endless calls for one day strikes became increasingly routinised, with little serious effort to mobilise for action. Many workers ignored them and waited for the promised final catastrophe that never arrived. Instead of the big bang of mass redeployment or redundancies, the outcome was the slow lingering death of Council services from a thousand cuts, continuing in Lambeth and many other places for years to come.